I’ve always found this story of Mary and Martha perplexing. Mainly because of Jesus’ response to Martha. It seems very reasonable for Martha to want to do everything possible to make Jesus feel comfortable and extend hospitality like most of us would do when someone comes over to visit. In contrast, Mary sits herself at Jesus’ feet, soaking in his presence and hanging on every word. When Martha protests, Jesus says that Mary has chosen what is better. I have to admit that every time I read Jesus’ response, I feel an instant punch in the gut and yet intrigued by his response at the same time. The progressive feminist inside of me says, “Yay for Jesus!” How wonderful it is for Jesus to empower Martha to sit, learn, and engage in thoughtful, theological dialogue. The other side of me who takes pride in an orderly clean house (the kind a Korean mother would be proud of) says, “Oh no you didn’t!” I can understand a sense of betrayal or embarrassment for being put in my place that maybe Martha felt. One can argue that it was Martha being distracted versus what she was doing that Jesus was addressing, but even so, I often feel that Mary and Martha symbolize the tug-of-war of my own sense of call as a pastor and as a women in ministry in the 21st century. I love my job. I love my congregation. I love my Head of Staff. It seems unlikely that these three love statements I just made be true. Especially since I am a woman – a racial ethnic woman – and on top of that, a young (ish), racial ethnic woman. And yet it is true. I serve a congregation that values my gifts, ideas, and vision. I work with a Head of Staff who values me, trusts me, collaborates with me, works through conflict with me, respects me, and most of all does not let his ego get in the way of sharing leadership. Given my reality, one would think that women in ministry have come a long way now that we have entered the 21st century. In many ways we have. In many ways we still have a long way to go. And in many ways, new challenges have cropped up. If you followed what happened at the 219th General Assembly (Presbyterian Church U.S.A.), an overture to form another non-geographic, Korean language presbytery, which overwhelming passed in committee, was later overturned in plenary. One of the issues I raised was in regards to the challenges of ordination of Korean women as well as opportunities for younger generation leadership. 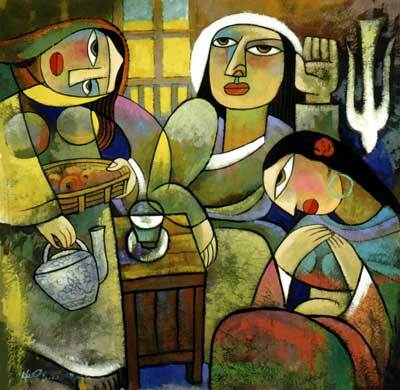 Even as the Korean American Presbyterian Clergywomen celebrate 20 years this year, many Korean-American women still struggle to find a call to be ordained as Ministers of the Word and Sacrament. And although these struggles still remain, I find myself facing even new challenges as a women in ministry trying to have it all and do it all. How do I meet someone when the only people I hang out with are people at my church? How do I have the freedom to date while being entrenched in a faith community? How do I advocate for adequate maternity leave? How do I juggle motherhood and pastoral duties? How do I “convince” my congregation that having kids is not a hindrance but an asset? In a church that functions using a top-down model, how do I establish more collaboration, mutuality, and shared leadership? In a congregation that doesn’t revere women leadership as highly, how do I navigate through the customs and politics in a way that is prophetic and not isolating? What do I do when I am not being taken seriously or not acknowledged when male clergy are present? What do you do when cultural traditions are used as a reason for women in ministry to not be accepted or respected? How do I grieve in public after experiencing a miscarriage or personal loss or am I expected to hold myself with composure? How do I react when congregants constantly comment on my hair and clothes, but not to the male clergy? Or when my pastoral authority is questioned or negated because of my gender? In a small congregation, how do I find resources and colleagues for support? This list certainly isn’t complete or exhaustive, yet it gives a good snapshot of the Mary and Martha-like tug-of-war many of us may face between our personal and professional life, our reality and what we hope our reality will be, and all the factors that play into our experience as women in ministry. For me, being a women in ministry in the 21st century means being both a pastor and a mom and not being able to separate the two. Luckily, I serve a congregation that is very kid-friendly. But what do you do when you are in the middle of preaching, driving home your final point and your 3 year old son who refuses to go into the nursery throws a temper tantrum right in front of you? What do you do when you are about to break bread during communion and your 2 year old daughter has escaped the nursery and tries to steal the communion bread out of your hands? Or what do you do when it is the fourth night in a row that you have come home past the kids’ bed time? For me, to be like Martha would mean taking care of my family and having the time and energy to spend with them, while to be like Mary would mean being able to devote myself to spiritual care and the needs of my congregation without distraction. However, the tug-of-war doesn’t have to be about motherhood and ministry. I think we all experience the challenges and joys of trying to feel fulfillment in our sense of call. For others, Martha may represent the more active parts of our ministry while Mary represents the more contemplative and passive. My hope for us women as we continue to do ministry in the 21st century is that we embrace the diversity amongst us and therefore extend grace to one another in the sisterhood. The world is already a challenging and judgmental environment. We should celebrate the accomplishments of each other, stand in solidarity with those who are still fighting the good fight, empower each other to take ownership of our authority, and share our stories and resources because none of us can do this work alone. Let us use our unique, God-given gifts to change the world. What has been the tug-of-war in your ministry experience? What have been the joys and challenges of being a woman in ministry? How do you feel the landscape of women in ministry has changed in the 21st century? I enjoy your musings on being a woman in ministry – my situation is very different. I am given the freedom to preach and teach, but generally my church does not accept women in leadership and there are some noticeable absences when it is my turn to preach! Women are allowed to be deacons, but not elders or pastors – although they are already exercising those gifts they are not given the acknowledgement, responsibilities, nor positions that men are. So I feel my church is like a person with a split personality, it depends on who I talk to what kind of encouragement or otherwise that I get. I have lived and worshipped in churches like this all my life and I was just thinking last night whether I can continue to do so. It is a male dominated understanding of ministry that has separated home and church. There is no reason for fatherhood to prevent men being involved in ministry, so there should be no reason why motherhood should be seen as a hindrance. The biggest problem is getting men to take up their domestic responsibilities so that women can be released into ministry. Blessings on your ministry at home and in the church community. Thank you Ruth for sharing your experience with me. It is a familiar experience for me as well. I grew up southern Baptist and when I felt called to go to seminary I switched to Presbyterian. But even in this denomination Korean women struggle to find a call. So in some areas we have a long way to go but I do believe more and more women like you have tremendous gifts to share.